This beautiful Brown Kraft business card is 22pt thick, flaunting a rustic appearance that is perfect for companies that are focussed towards the organic or natural industry. Made out of Kraft uncoated materials, the sleek finish is ideal for one-sided offset printing, lending to a tidy and clean-cut pattern. Black and white foil stamping has also been applied to the front of the template to add a level of vibrancy as well as introduce a more refined feel, without detracting from the primarily modest and earthy design. 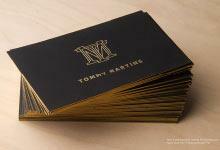 As the foil stamping does approach the edge of the card, the use of oversized plates is a requirement. Heather’s template business cards are a beautiful way of saying a lot about your business without going over-the-top, and are sure to exude a feel that is both charming and homely. Recipients of this card are sure to be warmed by the welcoming and familiar appearance of this design.